Seen as the best roses to create height and a formal look to gardens, standard roses have been popular for many years and are readily available for sale by post from online rose nurseries. This form of the popular ‘Iceberg Rose’ is one of the most popular of all standard roses however literally hundreds of varieties are available in many different colours, fragrances and flower forms. These are actually roses that are grafted onto long stems (a standard) grown on a hardy rootstock. They are used to create a formal look along a path, fence line or driveway or to add height to the garden bed. Usually they come in one of three heights, 70cm, 85cm and 105cm. So lots of roses are available as standards, they tend to be a little more expensive than bush roses because of the time put into growing the ‘standard’ and grafting the rose to the top. What to look for in Standard Roses. A strong graft is essential in a standard to prevent the top from breaking. Correct height for planting position. Remember that these roses come in different heights, choose the right height for the position. Strong upright, the upright that the rose is grafted onto needs to be strong and healthy, this part can’t be pruned. No suckers from the rootstock, these will be briars and are of no use for flowering. The planting distance will depend on the type you have chosen. Some grow bigger heads than others so spacing will differ. As a general rule, plant standard roses at around 1 metre (3ft) apart. This distance will give most varieties a little separation. 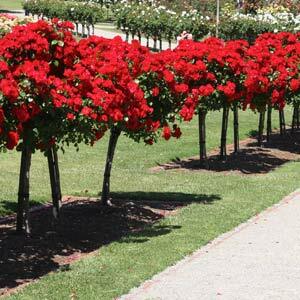 Standard roses are all grafted, often at 90 cm, although the new trend is for miniature types, grated at 60cm. These smaller types are well suited to growing in containers in courtyard and on patio areas. Standard rose supports or Rings. Like many roses, these will need a support stake or ‘rose ring’, metal is long lasting, timber is OK but will need replacing. Rose supports that are ornamental as well as strong are available from some suppliers. Similar to most other roses, they need to be pruned every year to prevent the head form getting to big and heavy for the stem as well as increasing flowering. Most can be easily pruned with secateures and the ‘vase shape’ style of pruning is most popular. Any suckers that appear from the the rootstock need to be removed with clean sharp secateurs. They will benefit from fertilizer applied during spring as do all roses. Standard roses are more suited to growing in the ground where they can develop a strong root system, however they can be grown in pots or containers provided they are given proper support.